As options for renewable energy purchase agreements grow, more businesses are coming into the market voluntarily. More renewables are being contracted by more big businesses in more states than ever before through an evolving set of innovative agreements that now include virtual contracts. 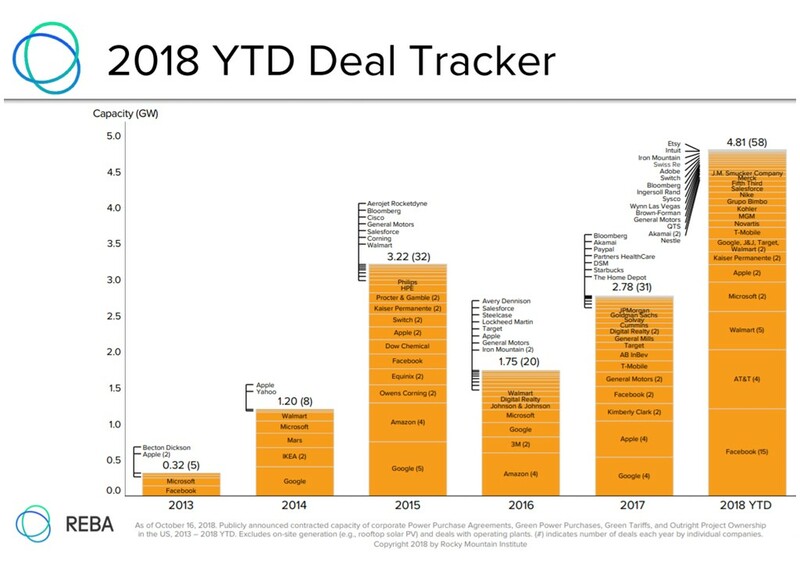 Corporate contracting for utility-scale wind and solar had a record year with 4.81 GW of deals completed in just the first ten months of 2018. The majority of renewable capacity is now being built with innovative "virtual" power purchase agreements (VPPAs), though "physical" PPAs are still available. The variety of deals allows companies in unregulated markets to focus on projects that suit their preferences, with some targeting lower costs and others targeting environmental or economic impacts. Physical PPAs deliver corporate buyers' contracted renewable energy capacity onto the local grid, offsetting the electricity purchased by buyers from the grid at a retail price or a pre-negotiated green tariff price, World Resources Institute (WRI) Clean Energy Innovation specialist Celina Bonugli told Utility Dive. 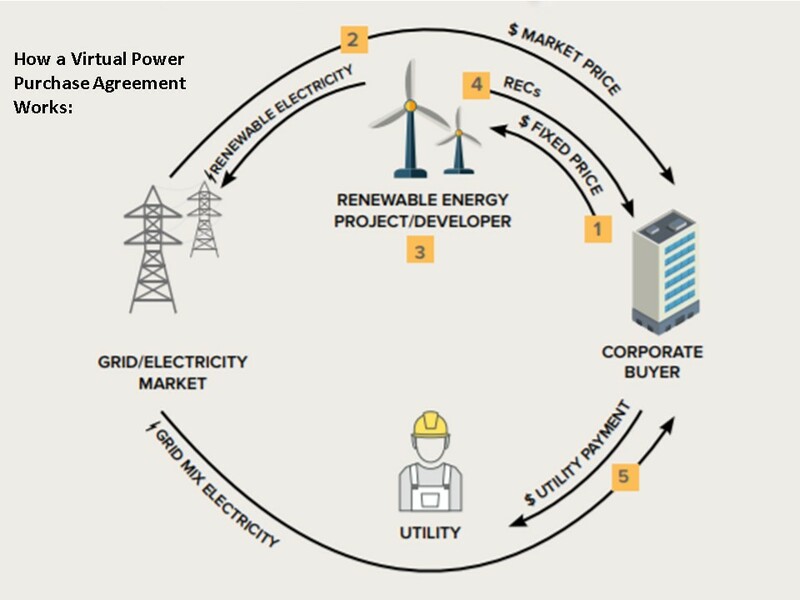 VPPAs deliver corporate buyers' renewable energy megawatt hours into the power markets in the projects' territories where the buyers pay contract prices and receive market prices. "A buyer can choose a project in an appealing, but far-away market that limits the project's impacts near the buyer," Bonugli said. "And market volatility makes the deal riskier." In regulated markets, green tariffs approved by state commissions provide corporate buyers the option of purchasing renewables through their utilities, she added. "Getting a green tariff approved by regulators can be complicated, but once in place it is open to a class of customers and does not have to be negotiated, which makes it easier than a PPA." There is now a "toolbox" that corporate customers with sustainability and renewables goals can use to purchase renewable energy, Bonugli said. "The tool they choose will depend on their risk profile, the market they are in and the kind of impact they want to have." The variety of options available to businesses looking to expand their renewables portfolio means that voluntary renewables purchases now make up over a quarter of U.S. renewables-generated electricity sales. A paper by the Rocky Mountain Institute (RMI) outlines that new toolbox and develops a case study on a manufacturing company's power purchase agreement in Indiana. 2018 is the biggest year yet for corporate voluntary renewables purchases. Retail electricity customers procure U.S renewables either voluntarily or to comply with government renewables mandates, according to the annual "Status and Trends in the U.S. Voluntary Green Power Market" from the National Renewable Energy Laboratory (NREL). In 2017, 5.5 million customers procured roughly 26% of U.S. renewable energy sales, which was 3% of total U.S. retail electricity sales, NREL reported. Compliance with mandates "accounted for about 57% of renewable energy procurement." Of the several "green power products" for corporate procurement, the most popular is the purchase of unbundled renewable energy certificates (RECs) by large, non-residential customers, NREL reported. They accounted for about 46% of renewables-generated electricity sales in 2017. Utilities have increasingly contracted with independent power producers for market-competitive renewables. And large buyers are increasingly moving toward PPAs, VPPAs and green tariffs. "The big theme this year is that unbundled RECs, which have been the workhorse of the voluntary market for a long time, are slowly being overtaken by direct PPA procurement mechanisms," NREL Research Scientist and report lead author Eric O'Shaughnessy told Utility Dive. "The market is evolving toward customers, especially corporate buyers, who want to directly support new projects." In 2014, WRI- and RMI-led groups formed to find ways to support an emerging appetite by large corporate buyers in the internet technology sector. In 2017, those groups became the Renewable Energy Buyers Alliance (REBA), which has a goal of adding 60 GW of corporate renewables purchases in the U.S. by 2025. Early members of REBA agreed on a set of principles corporate renewables purchases should maintain. Projects should be new, affordable and reduce emissions. Contracts should be long term, finance-able and include utility off-take options. Members have now built 14.08 GW of renewables in 17 states using 154 PPAs, VPPAs and green tariffs designed to incorporate the principles, REBA reported. There are now 23 green tariffs in place, according to WRI. In the first ten months of 2018, businesses had built 678.5 MW of new renewables with them, bringing the total green tariff build to 1778.5 MW. There are another 1,070 MW being negotiated. Green tariffs are still new, and it often takes utilities time to learn to navigate new concepts, O'Shaughnessy said. Unlike VPPAs, "green tariffs allow utilities to work with large buyers to build renewable energy projects that have local impacts in their own regulated markets. Green tariffs can also prevent large existing customers from defecting and attract new customers who want renewables options." A project built through a VPPA by a large Indiana industrial customer shows why it is an increasingly appealing option for renewables procurement. To date, at least 55 U.S. companies have signed over 80 VPPAs for new renewable projects, according to an RMI paper, which profiles a VPPA negotiated by Cummins Inc., an international power equipment manufacturer. Cummins, a Fortune 500 company, targeted a 32% company-wide reduction in energy use intensity and greenhouse gas emissions intensity by 2020. After careful analysis, it moved forward with its first VPPA, choosing the output of EDP Renewables' 75 MW Meadow Lake wind project in PJM's Indiana market. The project is at a distance from Cummins' Indiana location in regulated investor-owned utility (IOU) Duke Energy's territory. In its cost-benefit analysis, Cummins balanced community benefits and environmental impacts with financial risks. It started with two REBA principles: The investment had to "enable access to or help drive the development of new renewable energy projects" and "minimize the total cost to the company." Cummins also added two requirements of its own: an identifiable "significant environmental and social impact" as well as making it clear to investors that the company was funding a locally-supported Indiana project, reducing Indiana emissions and creating Indiana jobs, RMI Associate and paper co-author Ratchit Kansal told Utility Dive. A purchase of unbundled RECs would not meet these standards for "additionality" and "tangible impact" by proving positive local impacts, the RMI paper reported. Cummins also rejected procuring through a bilateral contract with the local regulated electric utility. Its premium rate would have enabled a new project, but not cost-effectively. And because Indiana law requires its IOUs to retain RECs, Cummins could not verify a "tangible impact" in a transparent way. The manufacturer did not want a physical PPA either because its Indiana load is too small to have a significant local environmental and social impact, and the premium price of the contract's rate would keep it from being cost-effective. A VPPA procurement met all of Cummins' requirements. It guaranteed the Meadow Lake project would get built, adding new renewables generation. Because it could be built in PJM's territory in northern Indiana, it would deliver local emissions reductions and economic benefits. And, though it represented some financial risk, Cummins' ability to manage market transactions meant it could be cost-effective. Cummins will pay a fixed price for the 15-year term of the contract. The project's electricity goes into the PJM day-ahead and real-time markets serving the region where the project is. Cummins continues using and paying the retail price for electricity delivered by its local IOU. The company is paid the earnings from the sale of the project's electricity into the regional markets, which means it's exposed to the market's variable prices. Cummins and EDF Renewables settle the difference between the contract's fixed price, which the manufacturer is paying, and the market prices. "A VPPA is a financial swap," Kansal said. "The guaranteed, long-term fixed price contract allows the developer to obtain financing and build the project, but the corporate buyer gets a floating market price in return and there is volatility in wholesale market prices." The company is essentially putting a bet on the market power price because if the market price goes higher than the contract price, Cummins profits and reduces it overall cost of electricity, Kansal said. If the market price drops below the contract price, the manufacturer loses money because the price it gets from the market does not fully make up for the contract price and its cost for electricity. "We do not have financial data, but Cummins has indicated it is satisfied with the VPPA," he added. In a regulated utility's territory, the viable renewables procurement options are a VPPA and a green tariff, if one is available, Kansal said. But not all regulated territories have green tariffs in place and they are often not cost-competitive. The VPPA provides more procurement flexibility, but it comes with the risk of market price volatility. The growing popularity and availability of renewables procurements is driving two emerging trends, according to Kansal. First, "large companies that have reached their internal sustainability and renewables goals are starting to green their supply chains," he said. "They are leveraging their buying power to get the smaller companies to buy renewables or offset their consumption." Second, "there is a trend toward internationalization," he said. Though it is still a small part of the total, some of the REBA partners are now working to grow corporate renewables procurements in China, Latin America, Europe and India. But the growing VPPA market should be less of a threat than a driver for the growth of green tariffs, Kansal said. "Some utilities seem to have gotten the message that they need to think about more cost-competitive green tariffs and the others need to realize they need to respond to the demand from their largest customers."